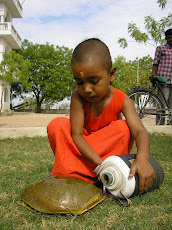 This boy calls himself OM. But it seems clear that in the future when he learns guitar he will be the next Lenny Kravitz. 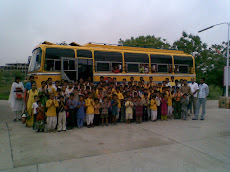 This is a picture of our first school bus, purchased in 2002 with the help of Swamiji and a charitable organisation from Hamburg, Germany. Together our two buses bring a total of 250 students from 10 villages in the surrounding area. Villages are chosen according to the interest of the population, the status of education in the village and accessability. The response from the villages is so good that we now have trouble to fit the students in the buses. On one route the above bus, which has 27 seats, brings 80 students. We have tried to restrict the numbers but the locals won't take no for an answer. The driver goes slow and as usual in India - it functions! Thanks to the continuous support of Swamiji, Paramhans Swami Maheshwaranand Ji Maharaj, the school computer lab is now equipped with 19 computers. 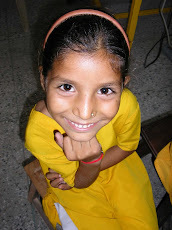 The students have computer classes from KG onwards, with learning games for english, maths and logic having being sent from people all over the world. In the senior classes students learn the basics of programming and of the various operating systems. 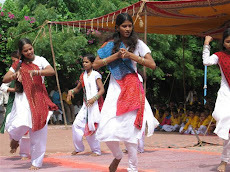 Students are taught by a mix of the modern and traditional. 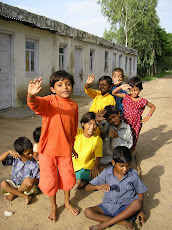 Village games are used for memory development whilst having fun. 26th January is India Day. A day of celebrations in schools throughout the land. The colours on the ground welcome everyone to the festivities. This was the first ever day in our school. It was the culmination of 4 intense days. 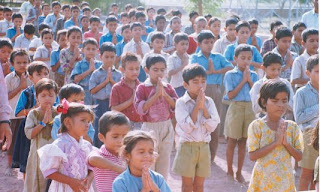 On 26th June our Guruji said that we should open a school for the new school year. School starts on 01st July!!! We spent 4 days interviewing teachers, arranging transport and touring the local villages at night telling them about the school and taking enrollments. Who knows how but on 01st July there was more than 80 students lining up for the morning assembly which is pictured. in the winter there is nothing better than sitting in the sun and warming up. With new uniforms and practice the morning prayers slowly started to sound and look beautiful. This photo is what it is all about. Joy of students and staff. 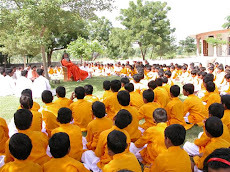 Welcome to our school, Shree Vishwa Deep Gurukul Vidyalaya. 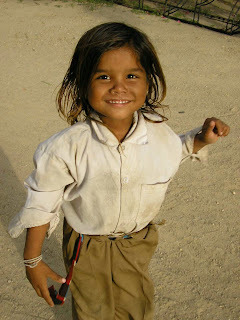 Hope you enjoy the photos, information and anecdotes which are part and parcel of running a school in rural India. Our school runs from Kindergarten till 12th class. 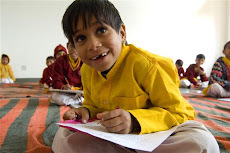 It is a coeducational school aiming to give the local students access to a quality education. More than 50% of the students attending the school are coming free of charge. Many are coming from illiterate family backgrounds however their love of learning, joy and energy get them through to become great students. Enjoy being part of our school! !